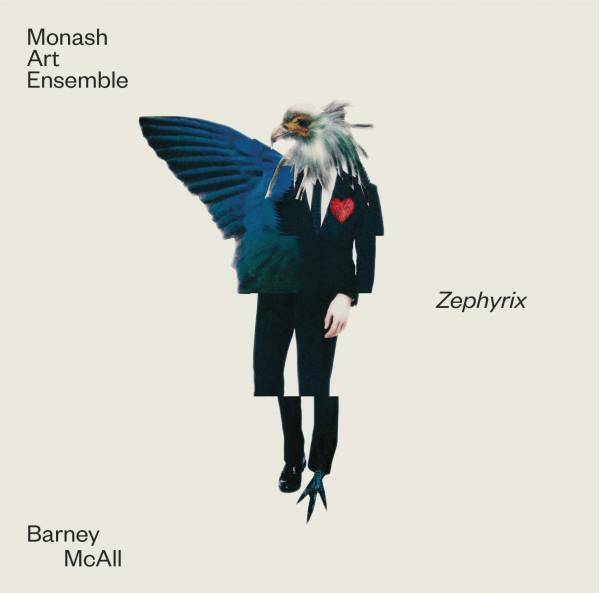 With each album Barney McAll’s artistry currently seems to scale new heights. Certainly Zephyrix (Zephyr amalgamated with Phoenix) is his most ambitious composition to date: a suite for 15 players evoking the five birds of alchemy. The music is both programmatic and philosophical in intent, celebrating transformation, while providing a soundtrack for the soul’s putative journey towards serenity. Black Crow, loosely representing release from the physical body, is a series of eerie hazes coagulating into sudden shafts of melody, through which runs a tinkling stream of McAll’s piano. White Swan, the first encounter with dazzling ethereality, is (surprisingly!) realised with a chunky ensemble groove and blinding trumpet and tenor solos. The transformational splendour of Peacock is evoked by otherworldly violin over a feathery backdrop, before an exotic ensemble fans out into multiple solos. The self-sacrificial facet implicit in Pelican is initially invoked with a percussion-heavy section, and then translucent solo piano. The title track – conceptually a rope-in, but musically pivotal – precedes the final alchemical bird, Phoenix, the transcendence of the physical realised by the album’s most haunting music transmuting into its most vigorous.